Seasonal allergies are a nightmare to many with respiratory diseases, as it can make their everyday symptoms even worse. But as spring is rolling in, there are a lot of steps to take in order to minimize how much allergens affect your health. If your allergies become very severe, meet with your doctor to discuss your overall health and what can be done medically to help relieve your allergies. We have some tips to help enjoy the summer without serious allergies or any flare ups. For many, even if you do not have year-round allergies, seasonal allergens often affect you and your breathing. 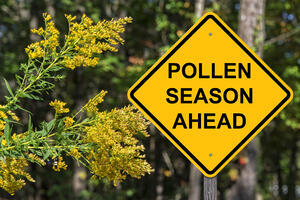 Common seasonal allergens that affect a majority of the public are ragweed and other weed pollen and molds. Ragweed can grow easily and nearly anywhere, growing along roads, in fields, parking lots and even your backyard. These weeds can produce over a billion pollen grains in just one season, and they grains are lightweight enough to travel over 400 miles. Outdoor molds easily grow in areas of heavy vegetation, such as hay, straw and leaves , and after rainfall. This additional moisture can help mold grow faster than if it were very dry. Through spring and summer, it is common for the windows to be opened in many homes, but it can be a bit much for those with allergies and respiratory diseases. If it is a beautiful day outside, look at the pollen count before you open any windows to your home, as high pollen days can make allergies worse. Check your local pollen count (or where ever you are traveling) here. Before spring fully arrives, look into installing a HEPA filter on your air-conditioner as well as a panel filter on your furnace. By installing both of these, your home will be protected from pollen and dust even when the windows are closed. Remember to check the filter every six months, and if it looks very dirty replace it right away, otherwise replace it once a year. Also try and stay indoors when it is dry and/or windy outside, as it can kick up dust and pollen, making it hard to breathe. Ideal weather is after rain, or snow, as it can help reduce the amount of pollen in the air. Every time you go outside, small particles from outside stick to your clothing, shoes, hair and skin, and make their way inside with you. In order to keep allergens low in your home try to keep everything clean, including yourself. When you get home, leave shoes by the door (so they don’t track allergens throughout the home), take a shower or bath, and change your clothes to clean clothes to prevent allergens from spreading. Outside of keeping yourself clean, keep your home clean as well. Allergens can hangout on your bed, sheets, and couch so regularly cleaning these pieces of furniture can minimize allergens in your home. Vacuuming your bed and couch can help reduce the number of allergens remaining in the home that came off of you and your family. Cleaning the floor around your main entry door (i.e. garage door, front door) can also lower the number of allergens that track further into your home. Also try to avoid drying any clothes or sheets outside, as pollen can stick to them and then be brought inside. 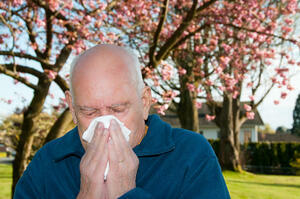 A slightly gross way to avoid any allergies this spring and summer, is to do nasal rinses or use nasal spray. A nasal rinse can help clear mucus from your nose, reducing allergy symptoms and removing bacteria from the nasal passageways. Nasal rinses (or even nasal sprays) can help reduce the amount of mucus in the nose, which also helps reduce the inflammation in the lining of the nose. Both a neti pot and a nasal bulb can help clear out mucus, bacteria and allergens from the nasal passageways. You can buy premade solutions or can make a homemade one with iodide-free salt, baking soda and distilled water. Mix 3 teaspoons of iodide-free salt with 1 teaspoon of baking soda and keep in an airtight container. When you want to use the solution, mix 1 teaspoon into 8 ounces of water and mix well and pour into the nasal rinse of your choice. Lean over a sink to flush out one nostril at a time and look up videos online if you are unsure how to do it correctly. For many with respiratory conditions, the outside air can be very harsh to breathe at times, this is where a mask comes in handy. Wearing a mask can not only reduce the number of allergens you are breathing in, but it can make the air warmer (if you live in a cold environment) and help add moisture to the air you are breathing in. Also protect your eyes with sunglasses when you venture outside, as pollen can come in contact with your eyes and cause eye irritation. It is believed that eating healthier and drinking more water can lead to fewer allergy symptoms. Having fruits and vegetables can help strengthen the immune system, making allergens less likely to affect your body. Be aware, some foods can come in contact with ragweeds, such as bananas, cucumbers, melons, zucchini, sunflower seeds and chamomile tea. These foods can then trigger allergy symptoms, so it is important to rinse thoroughly or avoid the food during allergy season altogether. Staying hydrated can help thin any mucus in the nasal passages, bringing relief if you do experience any allergy symptoms. Warm liquids (tea, broth or soup) can help break down mucus in the nasal passageways. Seasonal allergies shouldn't ruin the warmers months of the year, so using some of these tips can help reduce how much allergens affect you. Know what allergens trigger you, and do what you can to avoid them. Also do what you can to keep your home clean and yourself clean by reducing the amount of pollen brought into the home. Cleaning your nasal passages and covering them when you do go outdoors can both help reduce how many allergens your body comes in contact with. 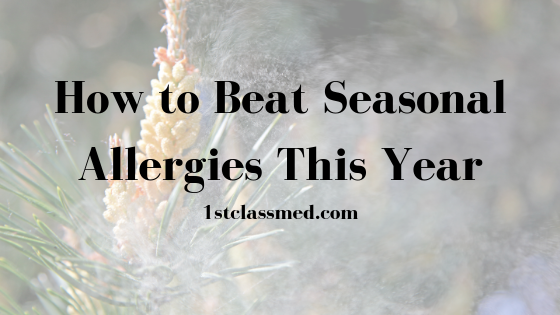 Lastly, knowing the foods and liquids that you put in your body can help your body stay healthy is an important step to beating allergies this season. Speak with your doctor if you have difficulties with seasonal allergies and see what they recommend based on your health.